The national sport in Thailand, Muay Thai also known as the “Art of Eight Limbs”. Muay Thai focuses on close, medium and long range fighting incorporating the use of hands, elbows, knees and feet. The Muay Thai Kids System at JAI Martial Arts comes from Grandmaster Toddy, coach of over 40 Muay Thai, Kickboxing and MMA Champions. He has created a program that is easy to learn, easy to apply and completely safe. Our authentic Muay Thai program is accredited by the Thai Government as a Black Belt program, allowing you to achieve a rank of Black Belt in Muay Thai. JAI Martial Arts is one of the only schools in Australia to be affiliated with Grandmaster Toddy and the Muay Thai International Association (MTIA). 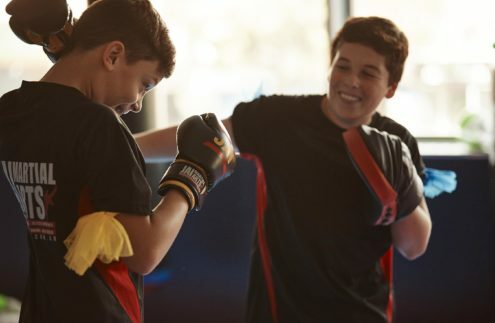 Our Muay Thai Kids Program is a great way to improve your child’s Confidence, Fitness and Coordination. Our program is easy to follow, safe and a lot of fun. Parents can even jump on the mats during our Friday Muay Thai Family Night – Parents and kids train at the same time with different instructors. A great way for parents and kids to bond over a shared experience. 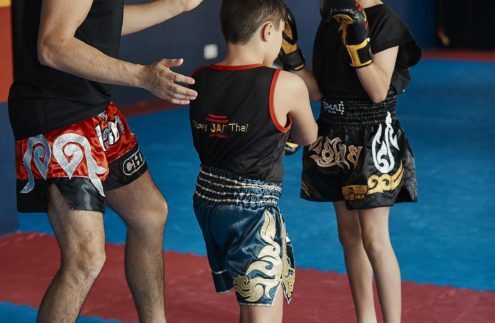 Starting in Term 2 – Kids Muay Thai every Monday afternoon from 4.30pm. Classes are open to kids from the ages of 7 and up. Dont miss out on your chance to learn Muay Thai with Master Chris. First class is Monday 30th April.